Kathleen used to work in the research library at the paper. I used to take a shortcut through her office, right past her desk. Probably passed it a thousand times. 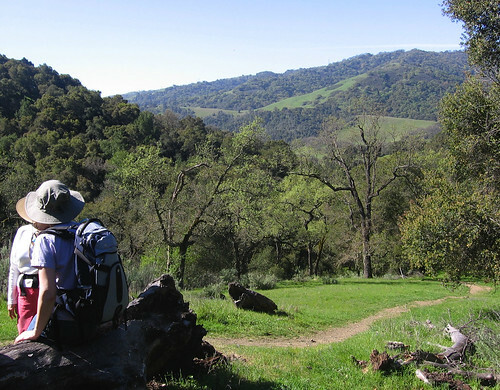 Yesterday I was at the Sunol Regional Wilderness, sitting on a rock at Cave Rocks along the Indian Joe Trail. Kathleen was sitting directly across from me on another rock. Her face looked tantalizingly familiar but I couldn’t place where I knew it from. Call it a senior moment. “Did you work at the paper?” she asked. That’s me, highly trained, skilled observer my surroundings. I’d seen Kathleen pretty much every working day of my life for five years, but hadn’t seen her around the paper she’d taken early retirement a year and a half ago. Sitting on her rock, Kathleen was having similar “can’t place the face” issues, though in her case it was more like “yeah but that guy had a much bigger beer gut.” (I’d hiked off about 35 pounds during her last year at the paper). This whole thing reminds me of my college days, when the wisdom passed down from upperclassmen to us plebes was that if you were sky high on amphetamines when you were cramming for your biology final last night, you’ll do better on today’s exam if you’re brain’s in the same condition; I doubt this would pass the Snopes test, but it was an excellent excuse to avoid the ravages of sobriety. Oh, yeah, the point: memories dwell in context. I had a “Kathleen at work” memory that would’ve been triggered immediately if I’d seen her in the hallway. She had no “thinner Tom in dark shades and hiking shoes” memories. I know what you’re thinking: Tom, for God’s sake get on with the pretty pictures of the outdoors already. Sorry, at these prices you have to suffer my keen mastery of the glaringly obvious. 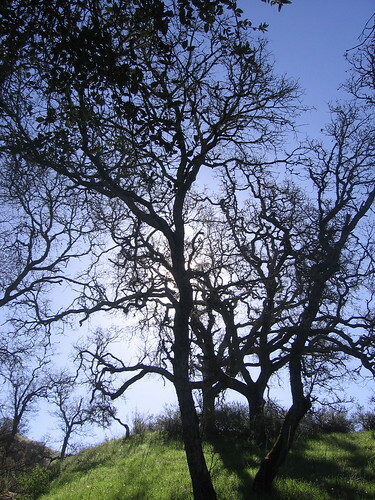 I have to include a sun-behind-the-trees picture so you’ll know it’s me and not an impostor posting this week. Mike ponders a tree near the Indian Joe Trail. 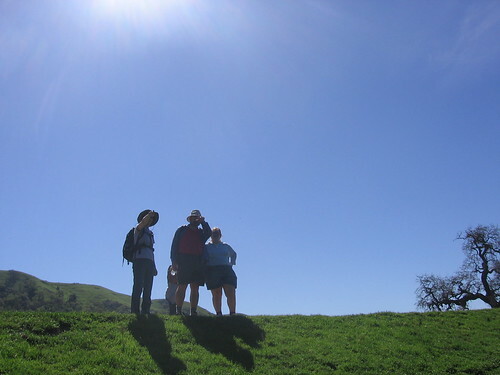 Sunol starts out in a valley and there’s really only one way to go to see the good stuff: up. Old dead trees lying along the trail have thoughtfully been left in place so hikers’ll have someplace to pause and enjoy the view. Pausing again to take in the view. We get a lot of that around here. 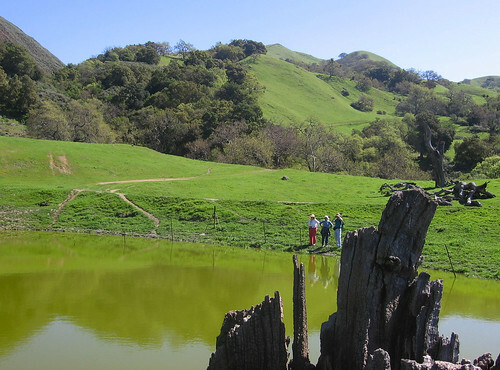 This pond is full of frogs, turtles and salamanders, which bob up for air and then dive back down into the murky waters. Playing “spot the salamander” is a good way to keep the kids occupied, and grownups find it quite amusing as well. 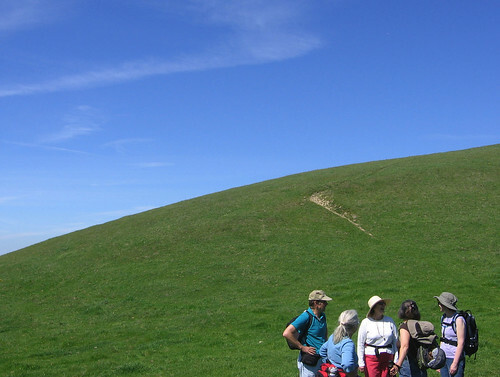 I just liked the natural arc formed by the hill in this picture. Flag Hill is an excellent locale for plopping down on a rock and taking it all in. Fomfok mainstay Peggy, with the hills of Alameda County behind her. 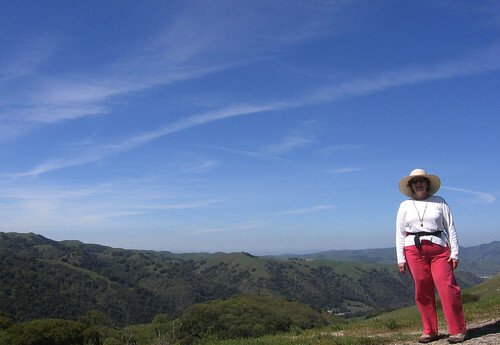 Peggy’s an intrepid trekker — ask her about the time she hiked four miles with a broken ankle. 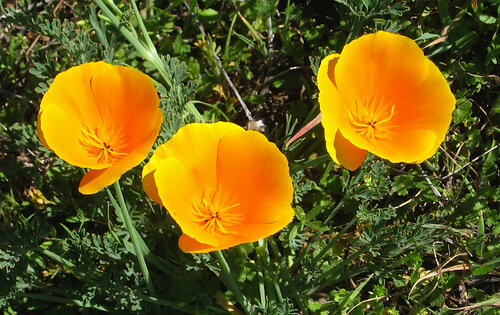 2007 continues to be a great year for California poppies. We’re starting to see large collections of them on open hillsides. 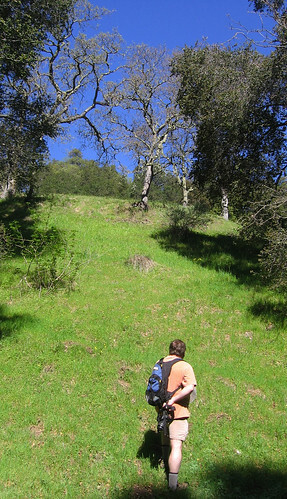 Picking our way down the Flag Hill Trail — which seems to be far steeper than it needs to be in many places. 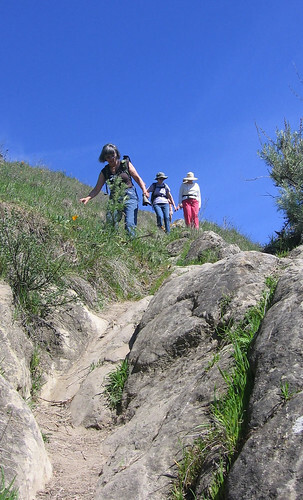 It can be fun, interesting and challenging right up to the moment when gravity overcomes a hiking shoe’s grip. So that was this week’s festivities. 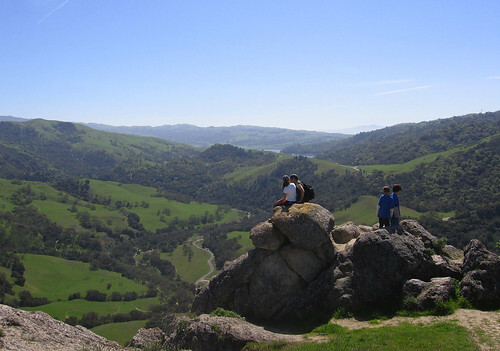 Next week we’re off to the Pinnacles National Monument, one of my all-time favorite hikes.